Jose's Art Journal: The Greater Journey. From the year 1830 to about the 1900's many Americans crossed the Atlantic in search of an education in France. Their objective was to improve themselves and bring back to the US the knowledge they could only then acquire in the French capital, Paris. Politicians, doctors, writers and artists endured the trip driven by a desire to learn and expand their horizons. In most cases, they arrived in Paris with no money, no knowledge of the language and very little idea of what they should expect. Due to the difficulty of the trip, they stayed years in Paris, worked very hard and absorbed every idea they were exposed to. Their stories are amazing and very illuminating. The result of their journey was an elite group that really launched the US on its way to occupy its place at the forefront of civilized nations. Many books have been written about the original Franco-American relations after the Revolutionary war (Jefferson, B. Franklin, etc...) . Also, most people are familiar with the 20th century iconic Americans that paid a visit to the City of Lights (Heminway, Gertrude Stein or Scott Fitzgerald.). But the period covered in McCullough's book is a little more obscure even though it is by no means less important. It's the time of the American Civil War and the Third Republic in France, the time of Abolitionism and the Commune. These were tumultuous times by any standard and it is simply amazing to read about the talented people that risked everything not only for personal glory but to bring back to America culture and new ideas. For some reason the first three chapters of this book are a bit hard to get through however. These chapters deal will writers like Fenimore Cooper and doctors like Wendell Holmes. But by chapter five I wasn't able to put it down. First, the book has a nice way of weaving the stories of all the characters involved and follow them across time and historical events. Secondly, the biographies of these Americans were indeed interesting, even exceptional. Who knew Morse was a very talented painter before going on to invent the telegraph for example? That the first american female doctor graduated in Paris. Painters like George Healy, O. Tanner, Beckwith, Singer Sargent and Mary Cassatt. Sculptors like Saint-Gaudens. Politicians like Sumner and Wishburne. The American colony in Paris grew and was tested at times by the various upheavals that shook France and the US, the Franco-Prussia war and La Commune being probably the most dramatic and violent fro the french residents but also, of course, the American Civil War. 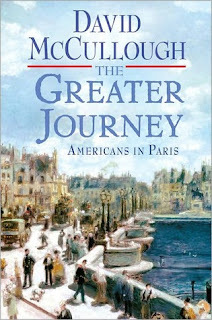 McCullough is a good writer in that he is able to convey not only the facts but also delves into the difficulties, heroism, and even moods of the people he writes about by researching their correspondence and documents. I recently read a book that would be the perfect companion to McCullough's but from the perspective of french painters: "The Judgement of Paris" . As a painter myself, I found interesting to know that both Manet and Wishburne were both inside Paris during Bismarck's siege, that Singer Sargent and many other American painters were competing with the likes of Meissionier and the group that would eventually become the "Impressionists" for medals in the Salon. But also the conditions in which artists worked and studied in France would interest any art student today and put things in perspective as to what being an artist meant and means today. The statue of Liberty, the Tower Eiffel, the Smithsonian Institute , many monuments and museums that adorn American Cities, ideas about science and politics, art collections and emblematic artworks... they all make an appearance, step down from their pedestal and become alive , controversial and relevant once more.